1. 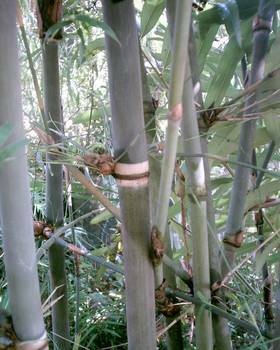 Bambusa blumeana J. H. Schultes in Schultes & J. H. Schultes, Syst. Veg. 7(2): 1343. 1830. Bambusa spinosa Blume ex Nees, Flora 8: 580. 1825, not Roxburgh (1814); B. stenostachya Hackel; B. teba Miquel; Ischurochloa stenostachya (Hackel) Nakai. Culms 15–24 m, 8–15 cm in diam., apically nodding; basal internodes slightly flexuose, green, 25–35 cm, distally initially sparsely strigose, later glabrous; wall 20–30 mm thick; each node of lower culm with a ring of aerial roots or root primordia, with a gray or brown sericeous ring below and above sheath scar. Branches to base, solitary on lower nodes, with branchlets usually forming tough, sharp, curved thorns and densely interwoven. Branches 3 to several on upper nodes, central markedly longer and thicker. Culm sheaths tardily deciduous, apex broadly convex or concave, with a triangular protuberance on each shoulder, densely stiffly brown hairy; auricles usually reflexed, crescent-shaped, linear-oblong, slightly unequal; oral setae dense, pale brown, curved, long, thick; ligule 4–5 mm, laciniate, fimbriate; blade usually reflexed, ovate to narrowly ovate, abaxially strigose, adaxially densely stiffly dull brown hairy, base ca. 2/5 as wide as sheath apex, margins ciliate. Ultimate branches with 5–9 leaves; leaf blade linear-lanceolate to narrowly lanceolate, 10–20 × 1.2–2.5 cm, both surfaces scabrid, mainly subglabrous but abaxially densely villous near base. Pseudospikelets 2 to several, clustered at nodes of flowering branches. Spikelets pale purple-green, linear, 2.5–4 × 0.3–0.4 cm; florets 4–12, central 2–5 perfect. Glumes 2, ca. 2 mm, glabrous; lemma ovate-oblong, 6–9 × 2.5–4 mm, glabrous, 9–11-veined, margins glabrous, apex acute; palea ca. 7 × 1.8 mm, 3-veined between and 3-veined on either side of keels, apex bifid. Filaments separate, 6–7 mm; anthers yellow, 3–4 mm. Ovary narrowly ovoid, 1.2–2 mm; style short; stigmas 3. New shoots Jun–Sep, fl. spring. Probably introduced, cultivated on river banks and around villages; below 300 m. Fujian, Guangxi, Taiwan, Yunnan [Indonesia, Malaysia, Philippines, Thailand, Vietnam]. 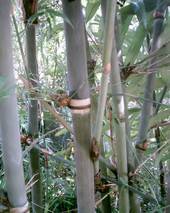 Bambusa blumeana 'Wei-fang Lin' (Guihaia 8: 122. 1988) was cultivated in Taiwan. It is characterized by the golden yellow culm and branch internodes, which turn orange with deep green stripes. The culms are used for scaffolding.